It’s the end of the month and you are short some cash. Yikes! This article was specifically crafted to help YOU make money fast using online apps. By the end of the post, you will be prepared with 15 new strategies to make extra money with only a few clicks on your smartphone! 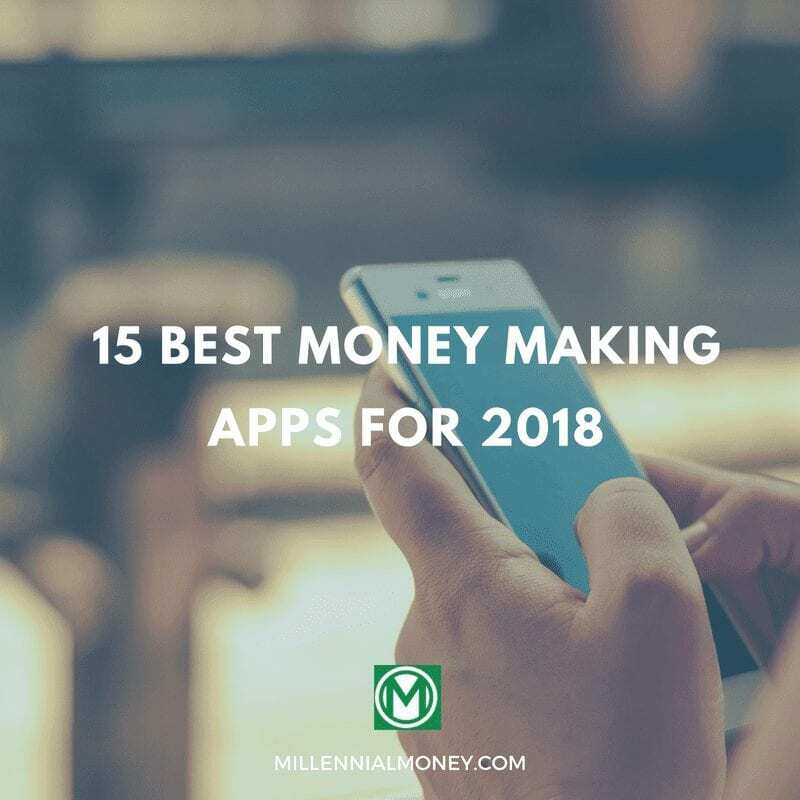 The Millennial Money team conducted a detailed review for the Best Money Making Apps to earn extra cash fast in 2018. During this journey we found that there are multiple articles addressing this topic. However, all of them include way too many options, which can cause distraction. We came across posts like: “30 best money making apps”, or “50 ways to make money from your cell phone”, and even “100 easy ways to make money online quick”. You do not need freaking 100 apps to make extra money! You only need to consider these 15 best money making apps below. Many of them give away free cash just for signing up. Before we go any further, you need to know that these money making apps are not a substitute for your day job. That said, they are a great way way to supplement income in the short term. Luckily, 2018 has never been a better time to utilize apps and technology to make extra money fast. For an explanation about why these money making apps are the best, continue reading below. We also provide a tutorial about how to use them! If you’re pressed for time (I know I am), I’ll cut to the chase and share the best apps that make you money. This article was specifically crafted to help YOU make money fast using online apps. Sometimes you need extra cash for bills. We’ve all been there, especially if you live in an expensive city. Maybe you are trying to save up for something special. If you are wondering how to make money today or what apps pay you real money, you’ve come to the right place. This section will dive into detailed to help optimize your money making app strategy. You will be prepared with 15 new strategies to make extra money with only a few clicks on your smartphone! These are the best money making apps for 2018. Survey Junkie is a legitimate way to earn extra cash while you are waiting for the bus, on your lunch break, or even when vegging on the couch. I like to take earn money with Survey Junkie as I wake up in the morning. Survey Junkie is 100% free and easy to sign up. Once signed up, (which takes less than 1 minute), you can start taking surveys on the go, from anywhere on your phone! Here’s a brief video about survey junkie. Why is Survey Junkie the worth your time? Simple. With Survey Junkie, you can make the most money in the least amount of time (compared with many other sites)! Plus, you can take surveys and make money on your phone! Using my specially design Survey Junkie Point-to-Time Ratio Calculator (further below), you can easily identify which surveys are the most valuable to take. Once you are signed up, and ready to take surveys, use this ROI calculator to prioritize surveys to complete. The key to success is to only take surveys that have the highest time to point (payout) ratio. In other words, it’s important to identify the surveys that will pay the most for the least amount of time. Check out Millennial Money’s survey review post. – 100% free to join and participate. Survey Junkie will never ask you to pay money. You will only get money!! – When you take surveys, you earn points which can be paid out in cash via PayPal, or via Amazon Gift Card! – legit online survey site that will pay you to be an influencer, and share your opinion to help brands deliver better products. – Security. All answers are completely anonymous! – Huge potential for massive earnings. – Some surveys will pay up to $50 per survey, and some will take you less than 5 minutes to complete! – You can utilize the Points to Time Ratio ROI calculator above to optimize efficiency. – You will receive a sign up bonus when you register for free through this link! – Only users from US, UK, Canada, and Australia are eligible. $10 free Amazon gift card welcome bonus for signing up! Swagbucks is the fun rewards program that gives you free gift cards and cash when you redeem points online. Additionally, you can use Swagbucks to take surveys online to earn points in exchange for cash! It’s really simple. Just press a few buttons in your free time and boom! Money! This is such a great money app to earn cash. Once you sign up to become a free Swagbucks member, you can start taking surveys to share opinions. You will earn Swagbucks points or SB points. Swagbucks will reward you with cash back or free gift cards. Like Survey Junkie, Swagbucks is one of the best paying survey sites that will earn you money from your phone and pay via PayPal. Swagbucks is known as the premier destination to take paid surveys to earn money for giving their opinion online. They give access to tens of thousands of paid survey opportunities each day. With every online survey, you are influencing decision makers from premier companies and organizations. – You can download the Swagbucks smartphone app to make money taking surveys in your spare time. – In addition to surveys, you can participate in simple takes such as watching videos! Fun! – When you complete tasks, you earn points which can be paid out in cash via PayPal. – Using the points to time ratio, you will be able to be efficient with your time and optimize your earnings. – legit money making app that will pay you to be an influencer, and share your opinion to help brands deliver better products. – Some surveys will pay up to $35 per survey. – You will receive a $10 sign up bonus. 100% free to join and participate. – Sometimes your cash out can take a few days. MyPointsis a platform that allows you to you earn gift cards for answering surveys, taking polls, watching videos, and many other online activities! You’ll earn a $5 bonus when you complete your first five surveys. $10 Amazon gift card after your first purchase through MyPoints! 1. Sign up for MyPoints (name and email address only). 2. Confirm your email address. Make sure to click the link in the email to get your free gift card. 3. Lastly, make sure to spend $20 worth from 1,900+ top retailers like Walmart, eBay, & Amazon. You’re going to buy things anyway, you may as well buy it through MyPoints to save money and earn that free gift card! Ibotta App is 100% free to use. Seriously, you do not have to pay for anything. Seriously, this is legit. You gotta try the Ibotta App! Over time, I continuously accumulate cash back on everyday purchases. After a large grocery shop, boom! cash back. After a trip to the mall, cash back!. Even after shopping for some items on Amazon, boom, CASH BACK! • Grocery, tons of cash back on food purchases from every store! • Travel, going anywhere over the holidays? • Clothing, you gotta buy clothes anyway, why not get cash back!? • Beauty & Wellness, looking fly! • Restaurants & Bars, earn enough for a second round! • Crafts & Gifts, make money and gifts! • Home & Electronics, don’t stand too close to the TV, you hear me!? Download the money saving and money making Ibotta App for free. Download the Ebates App today to start making and saving money today! Ebates is a cash back/coupon shopping site. If you shop online through Ebates you can earn cash back on your purchases. Seriously, it’s super easy to use, and you will see saving immediately when you download the free money saving Ebates app today. $10 Signup Bonus From Ebates that you can use on Amazon! Sign up and get a $10 welcome bonus today! Acorns helped me hid and invest my money last year. What does that even mean, you say? Well, with Acorns, you can set up this best money making app to round up your purchases to the nearest dollar. They take this cash and invest it into ETFs. Honestly, it’s pretty sweet. Say you bought a pint at the pub (no, I am not British) which cost you $6.90 (more like $10.90 if you live in an expensive city as I do). Once you download the Acorns App, it will automatically, round up to the nearest dollar and invest that 10 cents! This adds up over time. With the Acorns app, you can build an investment portfolio one dime at a time. This money making app is definitely a millennial investing strategy. You can set it and forget it, and build your investment portfolio without even knowing it. You can also direct additional funds into the Acorns app for investment. Really its a tool to help you invest more money, and an investment platform. Sign up today and try it risk-free! You will receive a $5 sign-up bonus by signing up with this link. Stash makes investing simple. Similar to Acorns, Stash is a money saving and making app that will roundup your purchases and invest. As far as investments go, Stash allows you to put your money where it matters. Invest in innovation, the environment, or anything that matters to you. Investing, simplified! With Stash, you can invest in stocks and ETFs that are carefully selected to reduce the expense ratio. Take a look at this quick 30 second video to learn why this best money making app is right for you! Paribus just secured 2 free months of Amazon prime for my mom. How is that possible you ask? Well, with the money-saving Paribus App, you can take back your money and refunded for things that you already bought! If you are someone who shops online frequently (I certainly am), then you might be looking at a quick refund! This is a great way to make an extra, $20, $30, or even to make $300 fast! Get money back automatically when prices drop on your purchases. Earny is similar to Paribus, but they operate with different algorithms, so it’s possible that Earny will find you further cash back. They will go into your mailbox and look for recent purchases for which you may be entitled to a refund. Take back your money with Earny. It’s as easy as 1-2-3! 2. Log into your email. 3. Earny will search our receipts, track any price drops on past purchases, claim the difference, and notify you of a refund. Ashton Kutcher was an early investor of Trim, which piqued my interest in the product. Trim is essentially an Artificial Intelligent assistant that automatically organizes your financial life. Back in 2015, this money saving app was limited to the easy stuff. It would go into your emails and linked subscription accounts and identify if you are paying more than you should. The money-saving app would serve as a negotiator with the companies and get you a reduced rate for the subscription. Now, Trim is becoming a money making app AI assistant that will help you reach retirement goals, help with credit card optimization selections, and identify the best insurance providers. Trims users saved over $1,000,000 in the last month. Get your results in less than a minute. Oh yeah, it’s free to set up and secured with bank-level security with 256-bit SSL encryption! Trim your expenses and start making more money with this app! Betterment is a robo-advisor that uses an algorithm to manage and re-balance an investors portfolio. I spent 1 year using Betterment. While I am not currently a Betterment user, I do recommend the platform for both people who are learning how to start investing and more experienced investors who are looking for an easy to use hands-off investing platform with an exceptional user experience. As more Millennial investors are starting to look for where to start investing, the team at Betterment have done an exceptional job marketing their service Millennials. Anytime I am searching online about personal finance and investing it is hard not see Betterment ads across most websites. A number of top financial bloggers also use the platform themselves, including Mr. Money Mustache who’s $100,000 investment into Betterment generated a spirited discussion in the comments on his website. Betterment is a solid choice for new investors who are looking to an easy to use platform and simple way to start investing. Click here to try out Betterment and get up to 6 months free. Wealthfront is one of the most well established automated investment service firms on the market. Their goal is to help your money grow with by reducing risk, taxes, and fees. As of 2018, they manage over $10 billion in assets. The great thing about Wealthfront is that they have extremely low fees. They can help you plan for retirement, invest your savings, plan for a home purchase, and plan for college. Wealthfront has been managing my after-tax and IRA investments since 2016. The best thing is that when you sign up with my referral link, you will get your first $5,000 managed for free. Yes, absolutely free. I started using Blooom to manage my employer sponsored 401k investment in early 2018. In less than a few minutes, Blooom analyzed my current 401k and identified risks and diversification issues. For less than $10 per month (if you purchase a year subscription) Blooom now manages my investment mix. Blooom estimates that I will make over $200,000 more by the time of retirement than with my current employer-sponsored target fund. Check out the Millennial Money Blooom review. If you do not have the AirBnb app, do yourself a travel favor and download it for free today. Wherever I travel, I check the Airbnb app for the best place to stay. But, I also use the AirBnb app to make money. When I was living and working abroad, I rented out my house using Airbnb. I was able to cover the mortgage easily. Furthermore, what I was living in the house, I would rent out rooms during peak college football season at a mighty premium. You can make so much money by renting out rooms with Airbnb. Fundrise is the crowdsourcing real estate investment platform that allows you to invest in real estate for on $500. If you are interested in investing in Fundrise, you can follow my affiliate link to invest with only $500 today! They expect an 8-11% annual return. In 2017, my annual return was 9%. I believe in this product and only recommend things that I’ve personally tried. A great alternative to entering into the real estate market. Fundrise allows you invest in real estate for only $500! This can be a solid return on investment and a great way to diversify your traditional stock and bond investment allocation. Additionally, Fundrise is a great way to invest in the real estate market while you are saving up for a downpayment for your future home! I have been investing with Fundrise for over a year now. Furthermore, I am an early iPO investor which means I own shares of the company. I believe in the Fundrise investment platform, so want to share it with you! Is Everyone Searching For The Best Apps To Make Money? Yes. In the age of online side hustling, everyone and their mother are trying to take advantage of smartphone to make extra money online. I know this because I am a nerd and spend a lot of time analyzing Google Searches to help identify user needs. The goal of this quantitative endeavor is to answer questions and come up with the best solutions for Millennial Money readers. 1. What are some Money making apps? 2. What were the Best Money Making Apps for 2017? 3. Best Money Making Apps 2016? 4. Best money making apps for android? 5. List of apps to make money? 6. Best apps to make money. 7. Apps to earn money. 8. Make money with apps. 9. Apps that make YOU money. Over 200,000 people search these terms each month. Clearly, there is a need to learn how to make money using app on your iPhone or Android smartphone! While there are many pages online that try to answer this question, this post lists out the 15 top ways to make money with apps on your phone.